Orlando, FL (April 27, 2017): David Weekley Homes, the nation’s largest privately-held builder, received three awards at the 2017 Greater Orlando Parade of Homes. The three awards bring the company’s total to more than 715 awards for product design and 1,150 overall. Chosen through the Greater Orlando Builders Association, the annual Parade of Homes showcases the best homes throughout Central Florida. The Mathis, Weekley’s model home in Preserve of Oviedo on the Park – Garden Series, was bestowed a merit award in the $500,000 - $550,000 category. The model home in Weekley’s John’s Lake Landing Manor, The Boulevard, received a merit award for the $600,000 - $650,000 price point. The Southhaven, the builder’s model in Laureate Park at Lake Nona Cottage and Village series, won a merit award for the category of $700,000 - $750,000. For more information about David Weekley Homes in Orlando, contact 866-994-3639. 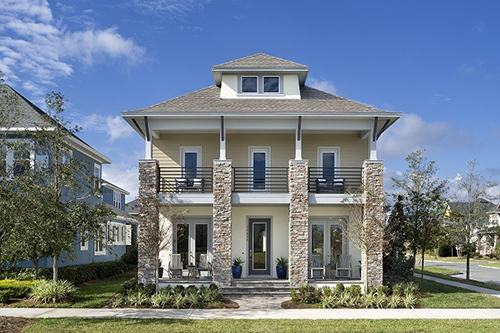 The Southhaven, David Weekley’s model home in Laureate Park at Lake Nona Cottage and Village series, earned a merit award at this year’s Greater Orlando Parade of Homes.